Alternatively, we could store the full path from a node to the top of the hierarchy. In this case, we'd basically be storing the "parents" for each node. In a tabular database, it would likely be done by encoding a list of the parents. 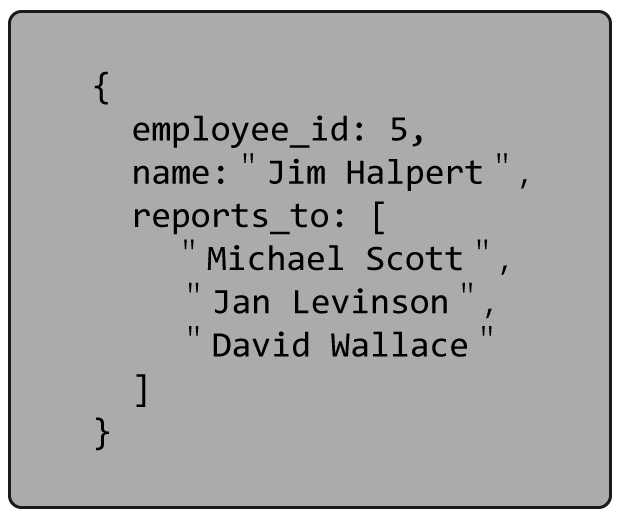 The approach in MongoDB is to simply represent this as an array. As can be seen here, in this representation there is some data duplication. If the information is relatively static, like in genealogy, your parents and ancestors won't change making this array easy to manage. However, in our corporate structure example, when things change and there is restructuring, you will need to update the hierarchy as needed. This is still a small cost compared to the benefits you can gain from not calculating the trees all the time. Note in the document above the ancestor_categories field which keeps track of the entire hierarchy. We also have the field parent_category. Duplicating the immediate parent in these two fields is a best practice we've developed after working with many customers using the Tree Pattern. Including the "parent" field is often handy, especially if you need to maintain the ability to use $graphLookup on your documents. Keeping the ancestors in an array provides the ability to create a multi-key index on those values. It allows for all descendants of a given category to be easily found. As for the immediate children, they are accessible by looking at the documents that have our given category as its immediate "parent". We just told you that this field would be handy.